From EM Newbanks of Columbus, Nebraska on 3/10/2016 . Love, love, love the Lamplighter books! This particular bundle fits in wonderfully with our unit study of the Ancient World along with other historical fiction as well as secular works. I have wanted to use Lamplighter books for reading that is applicable to the historical timeline that we are studying and these books fit perfectly while portraying the time through the lens of a Christian world view! Thank you so very much for offering this bundle ~ and at a cost savings!!! 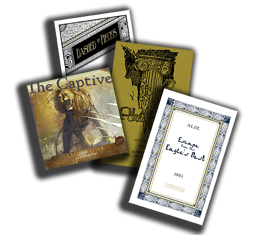 We have been collecting Lamplighter books and audios for 10 years now, and I have often given copies of the Lamplighter books/audio discs to my Sunday School students, friends, and family on the occasions of their birthdays as well as other holidays. I truly appreciate and support this ministry!